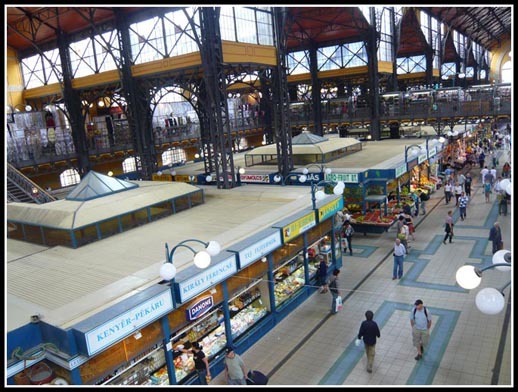 Just across the Independence Bridge lies Budapest’s largest indoor market – Central Market Hall. A great number of stalls offer a huge variety of vegetables, fruit, cheese and meat. 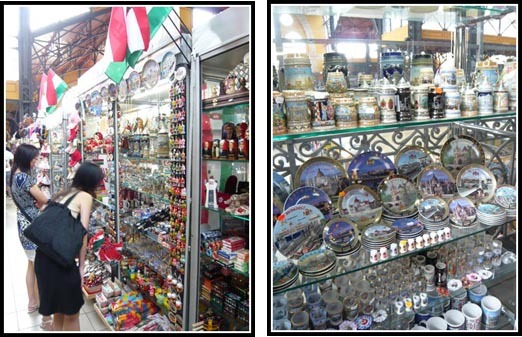 Most of the stalls on the ground floor offer popular souvenirs such as paprika, tokaji, and caviar. 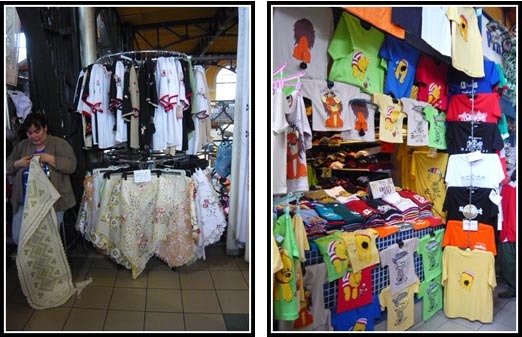 In the 1st floor you can find typical tourist articles, such as pictures, dolls, glasses, tablecloths, chess boards and clothes made in Hungarian style. 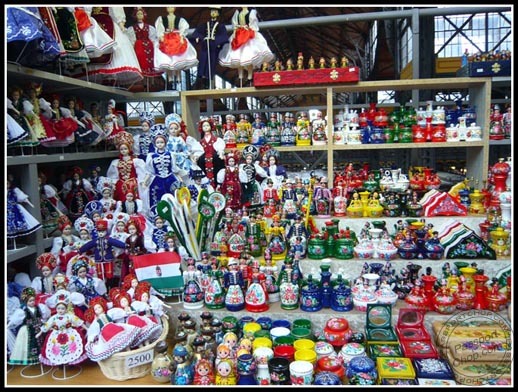 If you are looking to buy Budapest souvenirs, buy it here – prices at the famous shopping street, Vaci ut for the same items are 2-3 times more expensive. 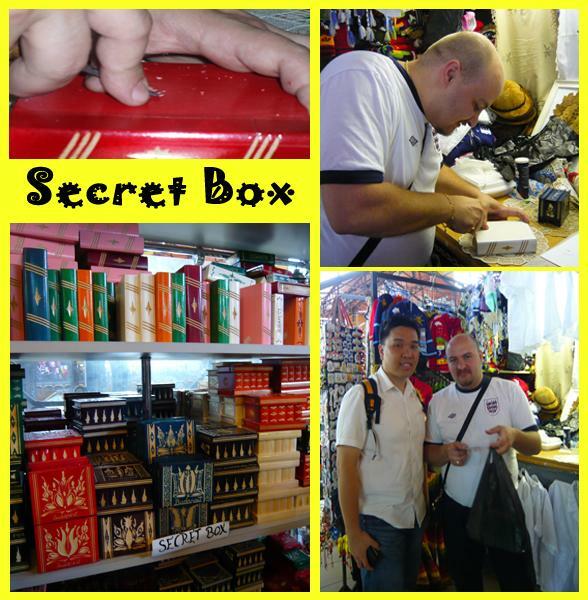 We bought Hungarian secret boxes for 1500 HUF each – this seller also provided value-added services e.g. name engraving for free. These boxes are crafted so meticulously that their hand-fit dovetail lids remain a visual mystery to the untrained eye. Once the dovetail lid is discovered, it can be opened by sliding it away to reveal a hidden compartment. T-shirt with ‘Bad Girls go to Budapest”. True? 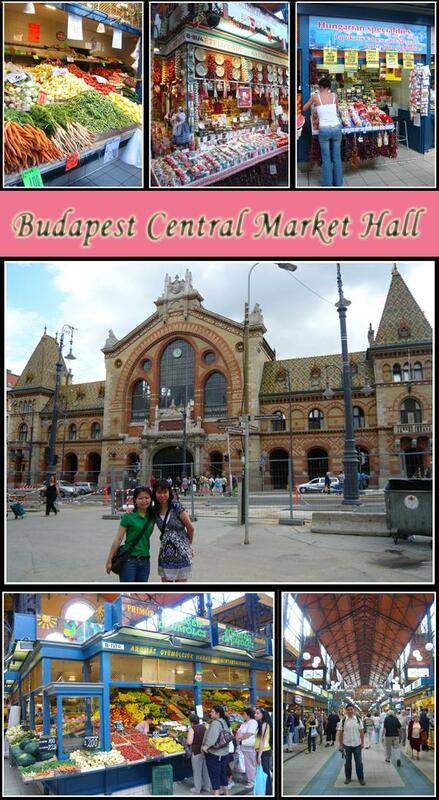 I will add one more phrase – they come from Singapore and go to Budapest! Why because their shopping around for hours had made me so hungry! Can’t wait for lunch at the marketplace. BTW there are many versions of this shirt in Central Europe; Bad Girls go to Prague, Vienna etc. Maybe i can start a new shirt in Singapore – Bad Girls go to Singapore…. 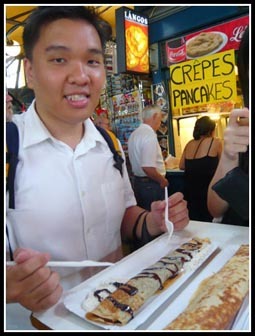 Besides souvenirs, fruits and meats, you can also settle your lunch at one of the many food outlets here. 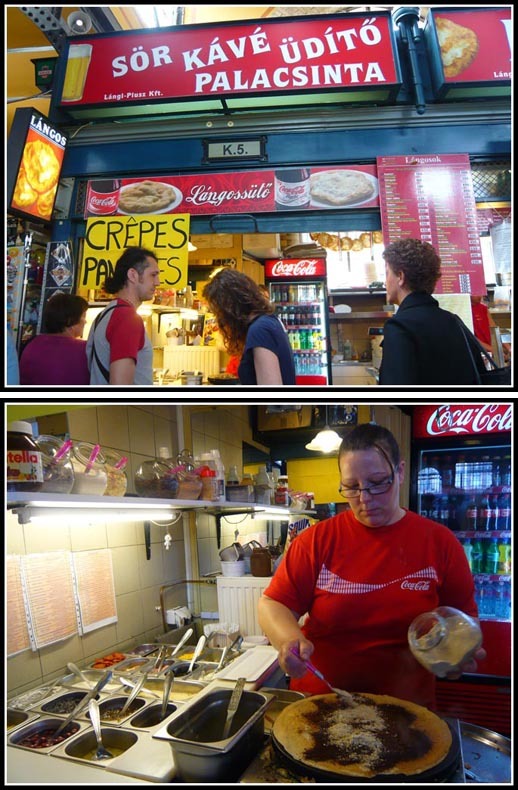 We settled our lunch here with some crepes in different flavors – cost about 600 HUF per crepe. 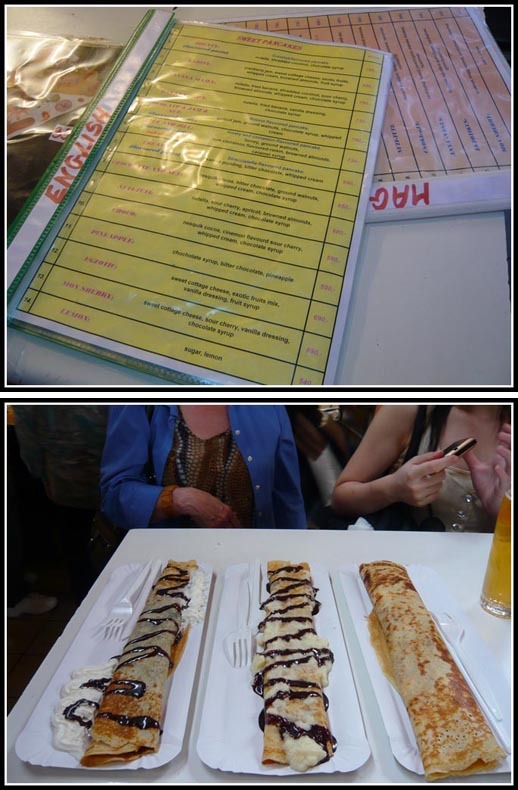 Take your pick of crepes from the English menu at the stall. 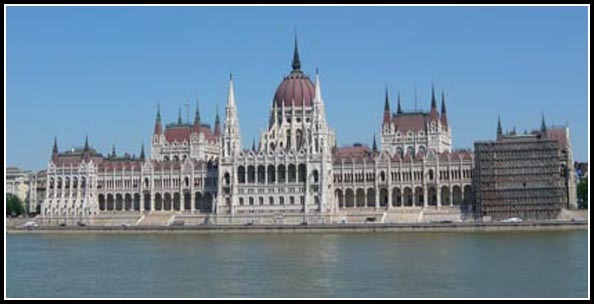 We also visited the Parliament. 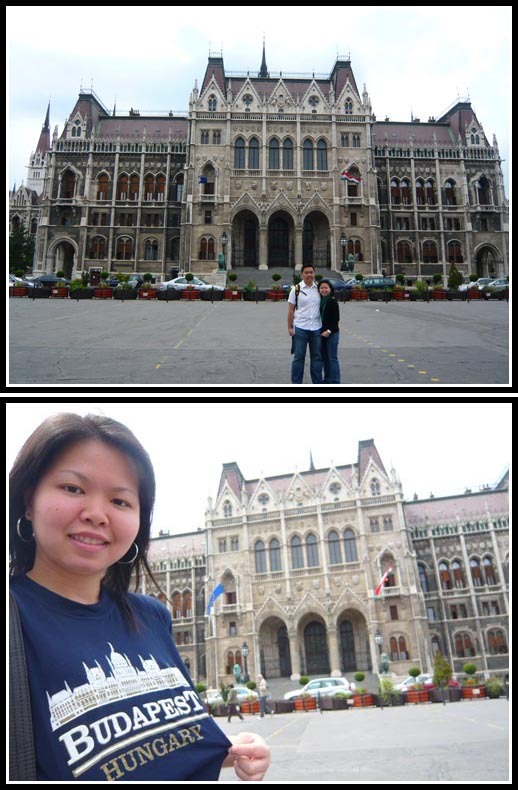 TY bought a shirt featuring the Parliament – only apt that she take a photo with the Parliament in this shirt. There are fixed timings for guided tours to the Parliament and they are usually snapped up very quickly so if you are keen, do buy your tickets early. 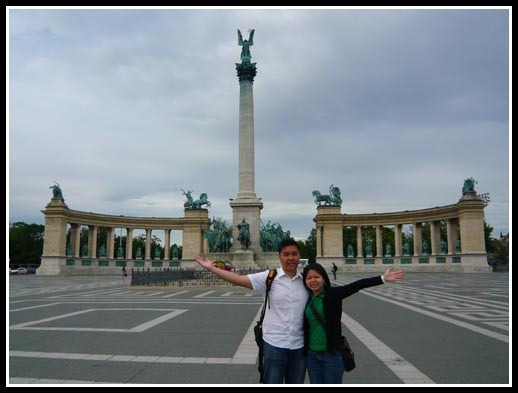 In the centre of the Hosok tere (Heroes’ Square) is this 36m-high pillar backed by colonnades to the right and left. Topping the pillar is the Angel Gabriel, who is holding the Hungarian crown and a cross. The 14 statutes in the colonnades are of rulers and statesmen – from King Stephen on the left to Lajos Kossuth on the right. The four allegorial figures atop are (from left to right): Work and Prosperity; War; Peace; Knowledge and Glory. 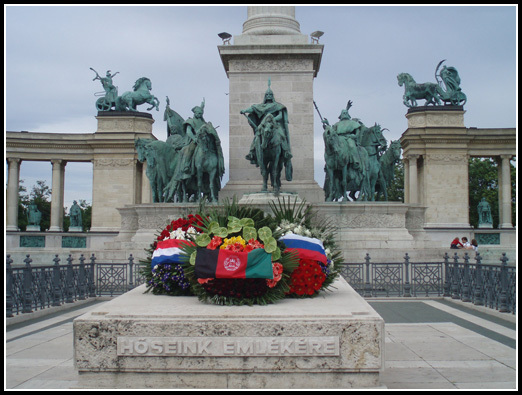 you seems to have fun in Budapest..i haven’t been there yet…nice pictures..
.-= Euroangel´s last blog ..Visit to Madame Tussauds in London, England =-.